The adapter is intended primarily for devices that are equipped with a Thunderboltâ„¢ 3 interface (MacBook Pro 2016, DELL XPS12, DELL XPS 13, DELL XPS 15, HP Elite X2, EliteBook Folio G1, Spectre x360, Lenovo Thinkpad P50, Lenovo Thinkpad P70 etc.). The connector has many advantages, it is smaller, symmetrical and allows easy connection, because you can rotate the connector either way . More information about the Thunderboltâ„¢ 3 / USB-C is available here . The adapter is an excellent choice for designers, graphic designers, gamers, and other users working with more than one screen simultaneously. Its performance allows you to run the most demanding applications on one or two independent displays. It is ideal for editing 5K / 4K 60Hz video or for other Ultra HD tasks such as CAD drawings or viewing medical images. Using the â€œExtendâ€ and â€œMirrorâ€ modes, you can for example use applications on two monitors (e.g., wide spreadsheets), or you can work on the first screen and search the Internet on the second screen, you can compare several documents simultaneously without constant switching between the open windows, also you can display panoramic images on two screens. Operation is very simple, just plug the adapter into the Thunderboltâ„¢ 3 port on your computer, connect it with a display device via Display Port cable and you can start using immediately. When connecting a single monitor through two Display Port cables it supports up to 5K 5120x2880@60Hz, the host graphic card has to support 5K resolution. 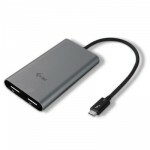 The adapter is compatible with active HDMI, DVI and VGA adapters, so it is also possible to connect displays and TVs which do not have a Display Port connector. Driver installation is automatic.